Nadi Legends Club (Fiji Soccer): NEW INTERVIEW: Our interview with Inia Bola (Ba and Fiji striker), by Henry Dyer, 17 June 2015. NEW INTERVIEW: Our interview with Inia Bola (Ba and Fiji striker), by Henry Dyer, 17 June 2015. 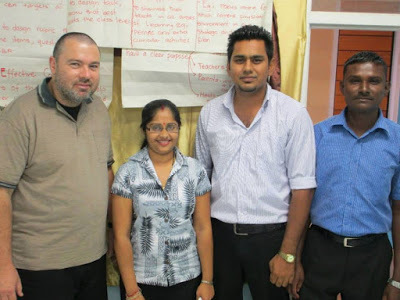 Left to Right: Henry Dyer, Inia Bola, and Kieran James with Inia Bola's granddaughter@ Ba, 17 June 2015. Henry played for Nadi and Inia played for Ba in the 1982 IDC Final while they were teammates in the Fiji team. Henry Dyer: Why did you choose to play soccer? Inia Bola: I loved soccer because as a youngster I had heard about teams like Argentina and Brazil and players like Pele. Kieran James: When did you start playing? Inia: I started in primary school at Ratu Rusi Memorial School at Nailaga Village, Ba. Inia: I played in the forwards. Henry: Can you remember what year? Inia: In the early-1960s to the mid-1960s up to around 1965-66. Henry: In high-school or for which club? Inia: For the primary school and then I later joined FSC Soccer Club. Sebuwaia Bola (Inia’s wife): 1972. Inia: 1968-69 through to early-1970s. I played in the club competition for FSC Ba. Then in 1973 I was selected to play for Ba district team. I was on the reserve bench as there were matured players there such as: Farouk Janeman; Bobby Shahadat; Vimlesh Singh; Josateki Kurivitu; Mitieli Turaganikeli; Ratubaka (all former reps, some of whom are still alive and some of whom have died). Ratubaka is the elder brother of Semi Tabaiwalu. Josateki’s mother is elder than Ratubaka and Semi’s mother (they are sisters). Soccer is in the family blood. Henry: After your school career, when you went to Ba, how many IDCs did you win? Inia: I played in all six IDC wins from 1975 onwards. I was one of the core players of the six-in-a-row team. Henry: One of the key players. Henry: During those years who were the players in the Ba team you respected most? Inia: I respected Bale Raniga. Inia: Because he was always teaching me things such as how to head the ball. Henry: I’m asking you questions like a lawyer now. Inia: Bale used to scold me on the field to tell me when I was wrong. I learned from his commands from the goalmouth. Henry: What did you think of Joe Tubuna? Inia: Joe Tubuna as a captain was good. He gave commands like an army general. He would swear at us on the field and tell us when we were wrong. This kept the boys together. Henry: Joe had the quality. Inia: He had a very high-quality standard of soccer; he was one of the best centre-links or midfielders in Fiji. Henry: What is your comment about Semi Tabaiwalu? Inia: One thing the Ba players were all good at was talking. Semi talked a lot because he could see everything from the back. Semi was an asset to the Ba team. He was one of the matured players who put their heads together to say who would be selected to play against a certain team. Along with the coach this group of players was also involved in team selection. Henry: One time we broke camp in Samoa [1983 Fiji squad at South Pacific Games in Apia]. George Samisoni was there. We said to each other: “Jahir Khan is a police officer. He can smell our breath”. We all started gargling the aftershave. He could only smell the aftershave. Inia: Those who were late for the aftershave went for the Colgate. Henry: Why do you think he became a good midfielder? Inia: He was a hard-worker; he was always looking for possession; he was all over the field. Meli had an understanding with the forwards. When the forwards were tired of attacking he would go up forward and the strikers would go back to take a rest in the midfield. Then later the strikers would go up into attack again. KJ: What is your comment about the Nadi team from the early-1980s era? Inia: As a striker I would enjoy playing against all other district teams because I would score against them. But, when I came to play against Nadi there was a psychological factor which would block my mind. They were a hard-tackling defence coming at you one by one. One of the dirtiest of the team was Inosi Tora. Inia: He looked like a gorilla. I was so afraid and ran away from the ball. Inia: In attack when I saw Inosi I didn’t look at the ball; I looked at Inosi Tora. Then he would say: “Why do you look at me? Look at the ball”. I would say: “No, I look at you because you look like a gorilla”. Inia: I have an injury still which is from Inosi’s dirty tactics. [KJ note: This is a dislocated collarbone injury which Inia shows to us.] I had to see the Fijian doctor in Nadroga called Dr Brown. The other great Nadi defenders were Emasi Koroi “Bacardi” and Peter Dean. The Nadi defence was very strong. I even told the Ba officials to change my position as I was having difficulty scoring goals. I said: “Move me around as I’m finding it hard to penetrate”. Henry: The officials could not read his mind. Inia: One time I beat the defence following a corner-kick at Govind Park. I beat the defence because I heard Save [Savenaca Waqa, Nadi GK] telling Inosi Tora: “Inosi, stick to Inia, don’t leave him”. So I went and stood beside Save and so Inosi forgot about marking me. I quietly left Save before the kick. I waited for Julie Sami to deliver the kick. I saw a gap between Bacardi and Inosi Tora. When Julie crossed from the left-flank I ran through the gap between Inosi and Save and snuck in a header just before Save could get to the ball. I then heard Save growling at Inosi: “I told you not to leave Inia”. Save told me: “You smart, tricky fellow; you wait for me next time”. Inia: All of this was said in a joking manner. KJ: What do you remember about the 1982 IDC Final against Nadi which featured the penalty shoot-out? Inia: Myself I thought I can’t miss the penalty-kick. I just don’t know how I missed it. After kicking the missed shot the ball hit the side of the post. When I got home I wanted to chop my soccer boots off [laughs]. KJ: Was Ba correct to turn up for the replay in your opinion? Inia: It was the officials who required us to get to the ground and walk on to the field. There was the threat of a fine hanging over our heads. KJ: Did you know that the Nadi players were upset about what happened? Inia: We knew very well that the Nadi players and officials were very upset! KJ: What do you think of Henry Dyer as a player? Inia: He was a really dirty player too. One time here I was going to break through; there was just the goalkeeper between me and the goals. Meli gave me the ball; I did not know Henry was following me. I don’t know how I fell down; I blame that Henry Dyer! Inia: After I was tripped Joe Tubuna wanted to punch the referee as it should have been a penalty. Henry: So Henry Dyer was a good, dirty player? Inia: A dirty and cunning player! He would put his foot on the boot and I would look up at the ref and the ref would say “play on, play on”. KJ: Do you remember Fiji’s win over Newcastle United in 1985? Inia: No, I did not play as I was injured. Joe and Sami did not play and nor did I.
Henry: The love of the era was not only among the Ba and Nadi teams but around the nation. You just had to slot in for those who were not there. KJ: Do you remember the 1-0 win over Australia in 1988? Inia: I did not play in that game. Henry: That time his brother Madigi was in his prime. Inia: Our father told us: “If you want to play soccer, play soccer; if you want to play rugby, play rugby”. I chose soccer as at that time soccer could take you anywhere on the planet. Henry: What was the best year for you in your soccer career? Inia: I enjoyed 1980 the most. At that time my father was still alive. That is when we had the 1980 IDC Final against Nadi at Govind Park [won 1-0 by Ba]. My younger brother Madigi played for the Under-21 Ba side which also won that year. It was a big year for our family. My father was still alive then and he was very happy. There was a record crowd of 15,000 at Govind Park which still has not been beaten. KJ: What is your comment about Rudi Gutendorf? Inia: Rudi was a good coach and strict. Once we played against Suva at National Stadium and I scored two goals. The score was 3-1. At that time the Fiji team had already been selected. Rudi saw me that time and put a phone call through to the officials. He said: “Include Inia in the camp at Sea Breeze Hotel [Lautoka] for the 1983 South Pacific Games”. He said: “This is the player I want”. Sebuwaia Bola (Inia’s wife): The squad was already in camp. Inia: Rudi asked the officials to look for me and to bring me to Sea Breeze Hotel to join the camp. There was only one week left before the final selection of 18 players. When I got into camp Rudi tested me and Robin Simmons (from Labasa). He tested us on kicking skills at goal. This is when I got selected ahead of Robin for that tour. KJ: What do you remember about the 1983 South Pacific Games? Inia: I still can’t forget that game against Tahiti when we were cheated by the referee and the linesman. They were all French. KJ: Meli Vuilabasa said it was a goal. Inia: I reckon that Abdul Manaan punched the referee because of the dispute and then the referee stood firm on his decision because of that. Henry: There was a big punch-up in that game. Inia: In that final the two things that I can remember most in the dispute about that goal are when the French officials ran for their lives and when the Fiji spectators jumped the fence to intervene. Henry: The Fiji spectators were mostly players from the other sports and they jumped the fence to keep the calm. KJ: Do you remember Fiji’s 10-0 win over Solomon Islands at the 1983 SPG? Inia: Rudi’s pattern of attacking soccer worked out well in that game against Solomons. We had the overlapping backs who acted as extra wings on the flanks and then the crosses came from the flanks and both Rusiate Waqa and I were good headers so it worked out well for the Fiji team. We had an understanding of who would take the header. KJ: Now we see very few header goals from corner-kicks in Fiji district soccer. Inia: They are afraid of the ball. For me I said that from three to five corner-kicks there should be one or two goals. Don’t waste the corner-kicks. Inia: In the 1979 IDC Final in Nausori between Ba and Nadi (this was to make it the fifth in a row) my youngest son (Kelemedi) who was just a month old died on the Saturday while we were playing in the final. My father said: “Do not let Inia and the boys know about this loss but bring back home the trophy”. They did the funeral rites very quietly so that the Ba boys could not be affected. If we had known we would have made our way back to Ba. Something unnatural happened to my two sons because they both died during my playing days when Ba was at its peak. I can’t say for sure what it was. KJ: Some witchcraft or black-magic? KJ: How many sons and daughters do you have? Sebuwaia Bola (Inia’s wife): The sons died and we have two daughters. The names of our grand-children are Mereoni and Tabaitha. KJ: What is your comment about the fact that it seems to be harder for indigenous Fijian players to become coaches and officials than it is for the Indian players? Inia: The admin is not fair. They are not giving the Fijian boys the chance to take up positions in admin or as manager or coach. KJ: Ravuama Madigi is one of the few. Henry: Only Madigi can because he has a level coaching certificate. KJ: What did you think when Madigi won the 2001 IDC trophy for Rewa? Inia: When Madigi moved to Rewa it was timely because Rewa had a good team but they did not have a finisher. When Madigi played with Rewa they clicked and enabled him to fit in well with them. KJ: And Rewa are like Ba in that their supporters are very fanatical. KJ: What do you think of the standard of soccer development at Ba these days? Inia: Ba has a very good soccer development system. They have Under-12s, 14s, 16s, and 17s in the Academy. They have all the stages at the Ba Academy. If the Ba team is not performing well they can easily pick up new replacement players from the Academy. They have a great crop of players to pick from. Henry: What do you think of the supporters of Ba during your time? Inia: The business houses of Ba put their money into soccer. They looked after the soccer players in our time. Motibhai’s (today this is Proud’s of Fiji) use to sponsor me. [KJ note: Motibhai’s started from a small grocery shop in Nukuluo in the interior of Ba.] They paid for my food, my bills, and wages. They paid for almost everything. Sebuwaia Bola (Inia’s wife): During that time of playing they played from their heart. They played for the pride of the district. Now they sell their districts out. Henry: Do you remember any other company sponsors? Inia: Joe Tubuna was sponsored by Ba Motor Parts as was Bale Raniga. Semi Tabaiwalu was sponsored by the Doctors’ Association in Ba. KJ: Is all this sponsorship still happening in Ba? Sebuwaia Bola (Inia’s wife): No, 4R Electrics have taken over everything. Henry: They are running the show for Ba Soccer now. Previously the sponsorship was very diverse and it was scattered across the population of Ba. Sebuwaia Bola (Inia’s wife): Before they used to say “if you score one goal I will give you $200”, etc. Before the game Inia would be offered money if he scored goals. After the game I would take the money. Inia would tell me who had promised money and after the game I would collect the money from them. KJ: Do you still go to games in Ba? Inia: No, I don’t watch it like I did before. Inia: Because they are not giving me any free ticket. Inia: They come and ask me to the party. Do they think I am a taxi-driver? KJ: Do you mean the 2014 Veterans’ Dinner in Nadi? Inia: Yes. They just gave me a ticket to the dinner but no transport. We live far away and many of us don’t work; we could not make it. KJ: The officials don’t understand the way of life and the problems faced by the Fijians if they just give them tickets but don’t assist them to go to the dinner. Henry: The officials today do not think about how far inland people are or whether they are bedridden, crippled or not working. They don’t find out how the guys are. They just pass over the tickets. Inia: My ticket was passed to me by Semi Tabaiwalu. Rajesh Patel did not even arrange transport for us. It would have been great for the Ba boys from my era to have been at that function. I hope that this will not happen again. The former Fiji reps should be given free tickets at least for the IDCs. KJ: Why don’t the indigenous Fijians go to watch district games and can this change? Sebuwaia Bola (Inia’s wife): Before, in our time, the players would tell the officials to let the whole family go in for free. The crowd was just waiting to watch the game as the word had got around that the players would let them in. It was like a chain. Sebuwaia Bola (Inia’s wife): The blood of soccer is in this family. My elder brothers played for Ba and Fiji. They were Waisea Naicovu and Esala Masi. Waisea’s son is playing in Australia now. He is also called Esala Masi. He is staying in Canberra now. Henry: What team did you enjoy to play against the most? Inia: Because I hate Suva. The media hype in the Fiji Times and on radio never stopped and it gave me a grudge against them. We are western and so we don’t want any trophy to go to that side. There will be reports in the paper and media for about a month if they win. Henry: Tell us about the car accident. Inia: We were having a few beers at Ba Hotel. Meli Vuilabasa was drinking there too. We planned to go to Tavua to do a dance where the Wai Koula band was supposed to play. It was a well-known Fijian folk band at that time. The nurses from Tavua invited the Ba Soccer boys to come over for fundraising. The boys decided to get transport down to Tavua. Sebuwaia Bola (Inia’s wife): Crowbar. Henry: Crowbars, pinch-bars, and all other metals. Sebuwaia Bola (Inia’s wife): They were admitted to Lautoka Hospital. Inia: I was saved by Kini Mocelutu (my elder brother) at ICU Ward. By this I mean that he brought me a Fijian herbal medicine from the highlands of Ba. This was for internal bleeding and fracture. Sebuwaia Bola (Inia’s wife): He lost his sense of taste and sense of smell. Inia: When Kini came to visit me and gave me the herbal medicine I was unconscious. He was stopped at the door by security. The security guard said: “This is a very intensive unit. You are not allowed to visit. If anything happens to Inia I will be blamed”. Kini said: “Please, let me see him for the last time before he dies”. When he walked in Kini could hear my heavy breathing from afar. I was breathing like a trapped animal which has a rope around its neck. Blood was still coming out of my mouth. Kini first opened my mouth and shoved in the herbal medicine for me to gargle in. Kini did this for quite some time before the security guard came in. I believe that this was the lifesaver along with the chain prayers coming from home (from my wife and family). KJ: Did you play any soccer games after the accident? Inia: Yes, I played again for Ba in the promotion-relegation game against Tailevu-Naitasiri. This was one year later when I had recovered. The officials (Vinod Patel and Mohd.) gave me some money to play in that relegation match. I scored four goals in that match. Ba was saved from relegation. Ba has never been relegated. That was my last match. Henry: Did you enjoy playing for Ba in your time? Inia: Yes, very much and I love the supporters of Ba. Henry: Why do you love the supporters? Inia: Wherever I go they will know me. I don’t want to spoil my future. They will always remember me. They know that whatever the coach told me to do I will execute on the field. KJ: Who was the best goalkeeper - Savenaca Waqa or Bale Raniga? Inia: I rated Save as the top in that era. Henry: Were there any other good goalkeepers in that era? Inia: John Grey from Suva. KJ: Are there any effects now from the car crash? Inia: In the heat I am still affected in my head. Nothing happened after the accident. There was no investigation. Henry: Do you sometimes still think of Joe Tubuna? Inia: Sometimes I look over the hills here towards the graveyard [see pictures] and I see Joe sitting up there. It takes my memory back to my playing days. Henry Dyer (left) and Inia Bola point across the hills to where Joe Tubuna's body is buried in Soweri Village Cemetery.